Josh was out of town last week on business. I was lonely-this was the longest we have been apart since we started dating. I tried to keep busy with work, the gym, the blog, etc. but I just missed my hubs. Luckily, one of my best buds came to the rescue. She always knows how to cheer me up. We enjoyed an evening of good food, conversation, and laughs. It was just what I needed. Before we were both married, we were roomies and used to cook together all of the time. 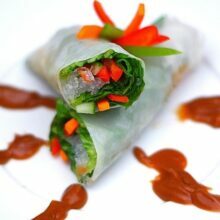 We’ve created a lot of tasty dishes, but vegetable spring rolls with peanut sauce are our favorite. For the spring rolls, we used carrots, green and red peppers, cucumber, lettuce, and cilantro. I’ve used Thai basil and mint before-instead of the cilantro, they are all excellent. We used round rice paper sheets for the base of the rolls and Asian rice vermicelli noodles for the filling. Most stores have an Asian section, if you can’t find these items there, check your area to see if there is an Asian market nearby. I love visiting our local Asian market-great prices and fun finds. The spring rolls are good, but the peanut dipping sauce is the BEST! I can’t even describe how good it is, there are no words. I could drink it by the gallon. Peanut butter, lemon grass, ginger, garlic, hoison sauce-all of these flavors work so well together. Try this sauce and let me know what you think. I am confident it will be your new “go to” peanut sauce. I have never tasted better. We had a great time recreating one of our favorite recipes together. The spring rolls are a great appetizer, healthy snack, or light meal. Serve these up at your Super Bowl Party for something fresh and healthy. Your guests will love them. For tips on how to roll fresh spring rolls visit The White on Rice Couple’s blog. They have a great tutorial post. You can add chicken, pork, or shrimp, but the veggies are good enough for me! 1. Chop all of the veggies and set aside. 2. Boil and drain noodles per package instructions. Cool under water. Set aside. 3. One at a time, soak rice sheets into warm water to soften. Use a shallow dish or pie plate for this step. Lay a rice sheet on a towel covered work surface. 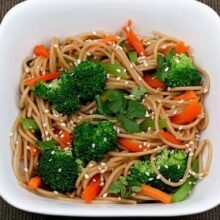 Working quickly, place some noodles, vegetables, lettuce, and a few herb leaves on the near side of the rice round. Roll mixture forward (in egg roll fashion) one revolution then add additional vegetables. Tuck ends inward and finish the roll. Continue making rolls until ingredients are exhausted. In a small sauce pan, simmer lemon grass in the water for 5 minutes, strain out the lemongrass and add the remaining ingredients to the water. Whisk well and simmer an additional 5 minutes. If the sauce doesn't thicken, whisk for one minute over medium heat. Pour into individual serving cups and serve with spring rolls. So colorful and just beautiful overall! I am a HUGE peanut sauce fan. I throw it on top of a big pile of veggies almost once a week. Yum Yum. Glad you had fun with your friend….I hate being away from the husband too! 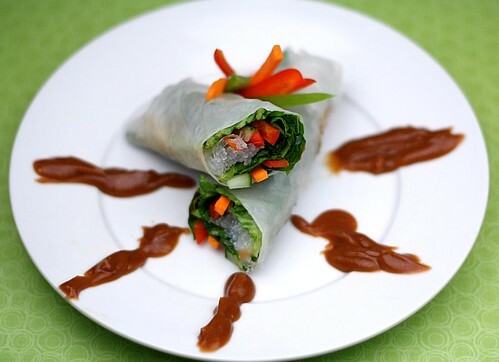 Love spring rolls – and peanut sauce!!! Always my favorite appetizer at Thai restaurants! These look wonderful and so healthy if I turn a blind eye to the peanut sauce. Your glass noodles look perfect, I can never get these to work, they go all claggy and horrid. I must seek out some rice pancakes like these. I have only had thie fried ones. I can imaginehow refreshing this one od tasting. Looks beautiful. I do a tamarind dipping sauce that would also be great with this. It’s just Tamarind Pulp boiled down with water and brown sugar. Then just strain it. I love spring rolls! I made them a while back from the Steamy Kitchen Cookbook. I used almond butter, since we can’t keep peanut butter in the house due to allergy. They are so yummy and fun to make with a friend! This is a perfect 10 in 10 meal! Looks so fresh and tasty! Ohhh Im so loving the peanut sauce! Light and refreshing! I just love your photography! It is amazing! Yum! I love peanut sauce. I love that you have a “print” option with your recipes! 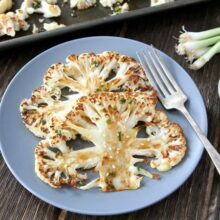 My vegetarian beau will LOVE this recipe. Thanks for sharing! Those matchstick veggies look like they were cut absolutely perfectly. The spring rolls are beautiful, and I’ll bet they tasted so fresh and delicious. I’ve never worked with rice paper before, but I was just talking about trying it recently. I’m bookmarking your recipe for when I do! Fantastic post Maria. Those pictures are worth a 1000 words…tantalizing the tastebuds! What a gorgeous post!! That peanut sauce looks SO good! And your photos… your PHOTOS! They are incredible! Those look beautiful. I am a big spring roll fan but haven’t tried them at home yet. Your photos are just so bright and beautiful, Maria! I hate it when my husband goes away since I have the worst time sleeping and just miss him like crazy so I know how you felt. Glad he is home safely and you are together again. These spring rolls look amazing with those brilliant colors of the veggies. I hope you are having a wonderful week. Take care, my friend. That first shot is gorgeous! I am with you – I could eat these everyday. Whenever I make them, I make extra so we can have as many as we want. Both my kids love them but I think what they really love is the sauce! I love spring rolls more than most things. I could eat these almost every day. And I don’t say that about many things. MMMMMMMMM, I love myself a good spring roll with some YUMMY dipping sauce. These look great and easy enough for my simple mind to make. These look SO good! And right up my alley, too. I’ll have to check out the tutorial, because rice papers always trip me up. Gorgeous photos, too! Oh I so love spring rolls and just never have taken the time to make them. Yours are so pretty, perfectly rolled and filled with the best of the best! So fresh! And wow I love that dipping sauce. I think you may have gotten me to finally get up and make these. What a perfect snack! Or I could really eat about 5 of them for a meal. Such a great post! Thanks for the ideas!! And the lovely photos!!! Wow! Those look so good and your photos just POP! I have been craving spring rolls lately, maybe I’ll have to go make some then huh! This is one of my absolute favourite meals! I make it when my (veggie) daughter is around as she loves it too. Delish! These look wonderful Maria! So fresh and colorful. I will definitely try the peanut dipping sauce. I’ve been dying to try making these and your sauce looks AWESOME!! I love spring rolls and have made them lots. I might have to try this peanut sauce tho, because I have a fave that I think is the best one out there! i love these fresh spring rolls so much! I always order them when i go to Vietnamese or Thai restaurants. I am a little intimidated by the rice paper but should get over my fear ;). Yours looks so good and vibrant!!! those rice sheets are so neat, and i can see why you’re smitten with the sauce. lovely meal, maria! I love these and we order them when we can. They’ve been on my list of things to make myself at home. I would definitely add shrimp! Yours look fantastic. Great picture too!!!!!!!!!!!!!!!! oh my gosh, these are gorgeous! love spring rolls! i found your blog from itzy’s kitchen, and i am pretty sure it is one of the most gorgeous things ever! i look forward to reading more! I am bookmarking this for the peanut sauce. I bet it would be EXCELLENT on chicken! Or as a sandwich spread. I’m in heaven just thinking about eating it. Fun times with old friends are really the best. I love it when my roommate from college comes to visit! Re: peanut butter-do you use all-natural or skippy/jif type? Bookmarked! These look so delicioius, colorful and healthy. YUM! Very immaculate and gorgeous looking rolls. Ed-I will have to try your sauce. Holly-Thanks for stopping in. We hope to see you often:) I love Erica! Dergolem-I have used creamy Skippy before and natural. Both worked out fine. Use your favorite! Where is the Two Peas and Their Pod cookbook???? These are gorgeous! We think so alike on our food choices. These spring rolls are filled with everything great and I would love that peanut sauce. I am staying inT-Ride another week….wanna come out this way? Easy trip from u guys! I have been craving spring rolls lately (totally weird because it’s freezing cold, but I know you understand the craving!). I bought the wrappers to make them forever ago, but this post just might be the inspiration that I need to actually make them. Yours are so colorful and pretty — it brightens my day just to look at them! Maria, this looks great! I’ve never tried anything like this at home, but you’ve inspired me. How wonderful to have an ex-roommate (& still close friend) to come over and cook with you. That alone would be as fun as eating this delectable food! OMG that top photo is GORGEOUS. I love this kind of roll (I’ve seen the unfried ones called summer rolls), but I’ve never thought to make them myself. I should try it! These look so good, fresh and vibrant! But the best part is the PB Sauce! One of my favorite things in the entire world. You were roomies? I think that’s so sweet! 🙂 Glad he’s back! This reminds me so much of the Filipino version (it has carrots and hearts of palm inside, and garlic in the peanut sauce). It looks sooo delicious and I need my veggies now! This is a timely post since I just visited our local Asian Market earlier this week and picked up some rice sheets. These look so great. Awesome job with the rolling. I love spring rolls, but have never tried to make them at home. Oh my. 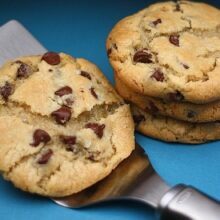 These look sooo tasty, and your photo is phenomenal! Oh goodness. I just really appreciate pretty julienne cutting skills and you knocked out those veggies like no one else’s business. Yumm…reminds me of the spring rolls which were our favorite at an Asian restaurant while we were in school at Penn State. Oh my, these look sensational!! I love spring rolls, but have never had them with peanut sauce. I will definitely be trying it. Gorgeous photos too! Haha – my salad has NOTHING on these babies!! These are beautiful! I love peanut sauce… One of my favorites. Usually I make it with grilled chicken, but I think I will have to give these veggie rolls a try! Your spring rolls look so colorful and healthful, too. I agree that many would appreciate these rolls at a Super Bowl party. I had a delicious spring roll last night at a Mpls. restaurant. It was filled with shrimp, crab, cucumber, laid on cilantro pesto and was drizzled with shrimp vinaigrette. It was so good. Mmmmmm…I keep saying that I’m going to make summer rolls and just don’t. I have GOT to do it soon. These look great! My goodess. Your pictures are so beautiful, I want to cry! The spring rolls look out of this world. I would eat a dozen of them, I’m sure. The spring rolls are beautiful, but the peanut sauce sounds addicting. No peanut allergies here, so I’ll try this one for sure. Thanks for the recipe! Wow! What a beautiful blog! The pics are gorgeous, very professional. I Love the Spring Rolls, they are a favorite at my house. Yours look especially good. 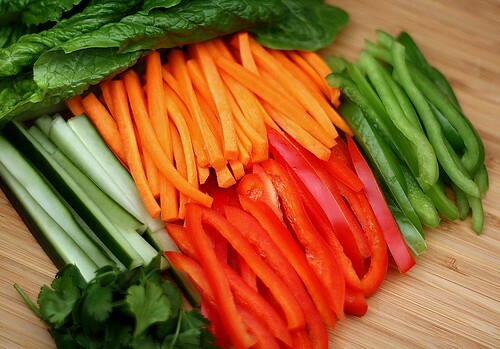 I love spring rolls and these look so vibrant and fresh. I have to try that dipping sauce! Love to make Spring Rolls but never thought to make a Peanut Dipping Sauce! Great idea! The lead photo for this recipe is just arresting. The bright colors of the interior of that spring roll just stopped me dead in my speed reading: WHAT. IS. THAT? I asked myself. Gorgeous. Thanks for sharing. Gorgeous click. Such lovely colours! I just want to make them because of the picture. Well, I love Spring rolls and peanut sauce. I just have to be cautious because of potential allergies for my children. But will make it just for me and my husband!! Maria, beautiful pictures. Just beautiful. I’ve never made spring rolls, but you’ve inspired me. What gorgeous pictures! I love how healthy these are the peanut sauce sounds delicious! These are gorgeous and sound delicious! I can’t wait to try! Hi Maria – You should know that this site is using your image, possibly without your permission. They appropriated one of mine as well (and have since taken it down). Since they derive revenue from ads on their site, I thought you should know that someone is making money on your work. I LOVE making fresh spring rolls. There are so fun to make and much cheaper than buying them at a take out Thai or Vietnamese restaurant! Also, your photos are absolutely phenomenal. Great job! thus is one of my favorite things to make! i could eat them all summer long. yum! those look good! i’m going to try them this weekend. they look so easy. These look so good. Great photos too! I like the addition of the peppers. I will try this peanut sauce for sure. I love spring rolls, these are great! We love Spring Rolls! And they’re fun to make and clean out the vegetable drawers at the same time! LOL! Maria, I will eat this peanut sauce with you all day long while Josh is out of town. Thanks for the peanut sauce recipe, I have been searching for a good one that is thick like the one at my favorite vietnamese restaurant, and this one is it! I just discovered you blig recently. The Springrolls with the Peanut-Sauce was the first recipe I tried and I loved it. I made them for me and my boyfriend, and we put tons of peanut sauce on them, because it’s so delicious. Thank you so much for this awesome recipe. I’ve been trying out some other ones as well. I’m hooked to you blog 🙂 Keep up the great work! Pingback: bar.none. | milk. and. honey. Just made these for dinner! Liked it but I think the sauce was too sweet! So to balance out the flavors I tossed the rice noodles with 1/2 tsp of sesame oil and sprinkled some garlic salt. But overall we enjoyed it 🙂 Going to try your Nutella cookies tomorrow. I love spring rolls! I have been on the look-out for those wrappers but haven’t found any. Maybe I will just have to make a trip to the Asian market so I can try out your peanut sauce! These are amazing. So much yummier and healthier than the fried kind. This is one of my favorite recipes now. Thank you for this recipe! I like you and I like this recipe. A lot! For a very specific reason. I remember writing about roasted salsa verde and saying that it’s not really a condiment here in California, you just tip your head back and it’s a meal! I would also like to say I’m not a cook, chef, foodie, anything. I’m an artist, but I know how to cook and was looking for a good peanut sauce recipe for spring rolls and yours fit the bill. Thank you. What a terrific blog! these spring rolls are absolutely delicious!! and the peanut sauce is beyond delicious! i love that you use lemongrass instead of sweet chili and fish sauces for the flavor. as a vegetarian, i am happy to have finally found a peanut sauce recipe that is suitable for my cooking needs. i am happy to have found you!! 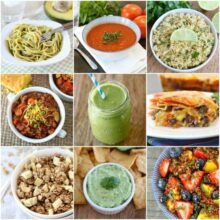 keep up the great recipes!! I just made these tonight and they were spectacular!! I had never actually made spring rolls, or even tasted them before… but they looked good so I tried it out. LOVE! About how much grated ginger did you use? I used a 1/2 inch nub or so. I also found this video to be helpful when teaching me how to wrap the spring rolls: http://www.youtube.com/watch?v=JTOgdljDwa0 Thank you for the awesome recipe! Thanks for the great recipe! I have made these with shrimp and the peanut sauce several times. Everyone requests it when we go to dinner parties. Absolutely the best peanut sauce and so easy to make. We really enjoyed these, especially the peanut sauce! I couldn’t find lemongrass in the store, so we left that out but it was still delicious. It’s a keeper in our house. Thanks for the recipe! love this recipe and your blog! about how many spring rolls does this recipe make!? Thanks!